Bellflowers or harebells are one of the classic plants associated with the English country garden. 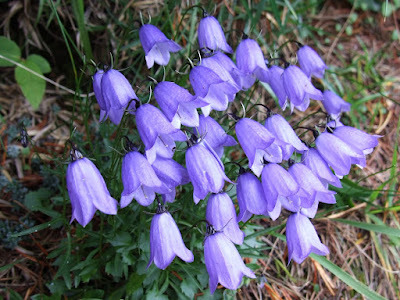 For today's post, I'll be covering the family of plants that bellflowers belong to. Fairy's thimble Campanula cochleariifolia, copyright Jerzy Opioła. The Campanulaceae are a family of over 2300 plant species found almost worldwide (Crowl et al. 2016). The family is, however, divided between five subfamilies that some authors would treat as separate families, in which case 'Campanulaceae' would be restricted to the 600 or so species of the subfamily Campanuloideae. It is this subfamily that includes the bellflowers. The vernacular name, of course, refers to the shape of the flowers produced by these plants, as indeed does the botanical name: Campanula translates as 'little bell'. These flowers are radiately symmetrical with all petals more or less the same size and shape and evenly arranged in a circle. Other subfamilies of the Campanulaceae in the broad sense, the largest of which is the lobelias of the Lobelioideae, produce more bilaterally symmetrical flowers with petals differing in size and/or with some petals closer together than others. Fruits are most commonly a capsule, with the seeds dispersed by wind, but some lobelioids produce fleshy fruits that attract birds. The lobelioids are most diverse in the southern continents, and it is thought that this may have been the original home of the family as a whole when it arose sometime close to the end of the Cretaceous, possibly in Africa. At some time in the early Cenozoic, however, the campanuloids arrived in and underwent a significant radiation in the Palaearctic. This dispersal may be related to the different flower morphology of the campanuloids, as they adapted from the bird, bat and butterfly pollinators of the tropics to the bee and fly pollinators of more temperate habitats. Glandular threadplant Nemacladus glanduliferus var. orientalis, copyright Stan Shebs. The genetics of Campanulaceae, specifically of their chloroplasts, should also not go unnoticed. The structure of the chloroplast genome in plants is usually very stable, with few changes in gene arrangement and order. However, at various points in the history of Campunulaceae, large chunks of foreign DNA have been inserted in the original plastid chromosome, with a number of these insertions also associated with inversions in the direction of adjoining sections of the original genes (Knox 2014). This kind of insertion is unique among flowering plants: changes in the gene content of plastids more usually involve genes being transferred out of the plastid. The source of this extra DNA is uncertain: it may have come from the plant's own nucleus, or it may have come from an as-yet-unknown endosymbiont. Also unknown is the functional significance of these rearrangements, if any. Some insertions have clearly resulted in pseudogenes, with their sequences rapidly breaking down through subsequent genetic drift. But others have preserved the structure of functional genes, suggesting continued selection for their retention. Cyanea duvalliorum, an arborescent Hawaiian lobeliad, copyright Forest & Kim Starr. The majority of Campanulaceae are small perennial herbs. 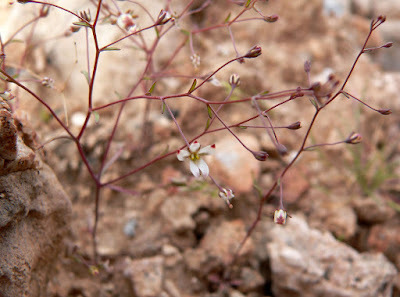 Two genera of distinctive enough to be assigned to their own subfamilies include annual herbs: the threadplants Nemacladus of southwestern North America, and the little-known Chilean Atacama desert endemic Cyphocarpus. Some members of the Lobelioideae are woody subshrubs, and at some point one of these woody lobelioids managed to make its way to the Hawaiian archipelago where it gave rise to one of the world's most remarkable insular radiations, and the single largest such radiation in plants. 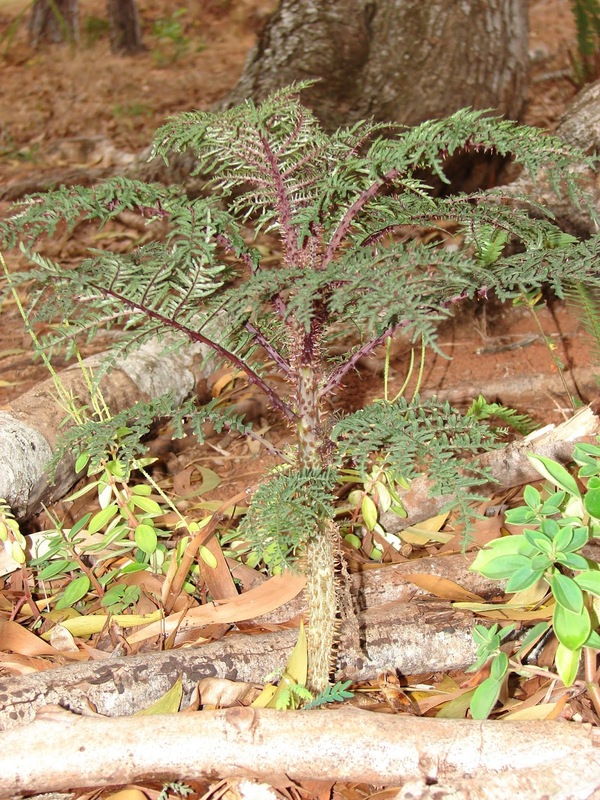 Over 120 species of lobeliads are known from the Hawaiian islands, varying from single-stemmed succulents to straggling vines to trees over 18 metres in height. There are inhabitants of lowland forests, of upland bogs, and of rocky cliffs. There are species producing fruit as dry capsules; others produce fleshy berries. So varied are the Hawaiian lobeliads that previous authors have inferred their origin from multiple seperate colonisations, but a study by Givnish et al. (2009) supported a single origin from a single colonist arriving about thirteen million years ago. This would have been before any of the current major Hawaiian islands existed (the oldest, Kaua'i, is a little less than five million years old); the implication is that the ancestor of the Hawaiian lobeliad arrived on a pre-existing island, perhaps corresponding to the modern Gardner Pinnacles or French Frigate Shoals. As the lobeliads diversified, they continued to disperse onto new islands as they arrived, while their original homeland eroded away. Sadly, a depressing percentage of the species forming this incredible radiation are now threatened with extinction, the victims of pressures such as loss of habitat, the decline of their pollinators and dispersers, or grazing by introduced mammals. The cliff-dwelling pua 'ala Brighamia rockii of Moloka'i is now restricted to five locations with an estimated total wild population of less than 200 individuals. A related species on Kaua'i, the olulu Brighamia insignis, may be extinct in the wild, having last been recorded in the form of a single individual in 2014 (it still survives in cultivation). As we earlier saw with the Hawaiian honeycreepers, there is barely a single section of the Hawaiian biota not marked by tragedy. Crowl, A. A., N. W. Miles, C. J. Visger, K. Hansen, T. Ayers, R. Haberle & N. Cellinese. 2016. A global perspective on Campanulaceae: biogeographic, genomic, and floral evolution. American Journal of Botany 103 (2): 233–245. Givnish, T. J., K. C. Millam, A. R. Mast, T. B. Paterson, T. J. Theim, A. L. Hipp, J. M. Henss, J. F. Smith, K. R. Wood & K. J. Sytsma. 2009. Origin, adaptive radiation and diversification of the Hawaiian lobeliads (Asterales: Campanulaceae). Proceedings of the Royal Society of London Series B—Biological Sciences 276: 407–416. Knox, E. B. 2014. The dynamic history of plastid genomes in the Campanulaceae sensu lato is unique among angiosperms. Proceedings of the National Academy of Sciences of the USA 111 (30): 11097–11102. Thanks for the plant post, especially such an interesting one. With the Hawaiian radiation and the radical chloroplast genome evolution, this is a fascinating family! The idea of plants island-hopping for millions of years as the islands behind them disappear under the waves is quite mind-blowing.